This book critiques the decision-making process in Article 53(a) of the European Patent Convention. To date, such decisions have been taken at high levels of expertise without much public involvement. The book eschews traditional solutions, such as those found within legislative, judicial and patent office realms and instead develops a radical blueprint for how these decisions can be put to the public. By examining wide-scale models of participatory democracy and deliberation, this book fills a significant gap in the literature. It will be invaluable for patent lawyers, academics, practitioners and intellectual property and patent officials. Outstanding disquiet: who gets to decide and how? 1.3.2.6 Morality – a case of doctrinal confusion? 1.3.2.7 Morality parameters: narrowing or broadening? 1.3.2.8 Morality and human embryos: a more restrictive approach? 1.3.2.9 Arbitration of morality: who should be responsible? 1.3.2.11 Ordre public: the EPO’s new morality? 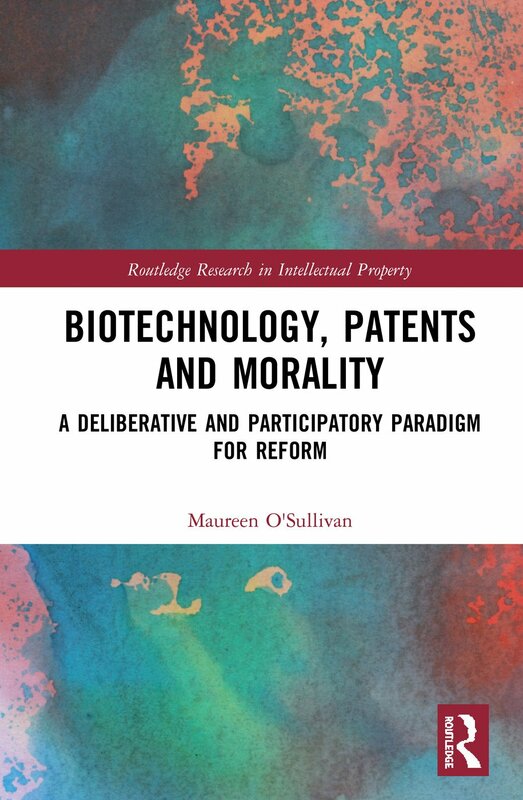 2.2.1 Can morality provisions in patent law just be ignored? 2.3 Would specialised courts better address the issue of morality? 3.4.3 Participation as a reform mechanism? 3.5.1 The nature of deliberation: confrontation or comprehending? 3.5.2 Classes of deliberative democracy: elitist or populist? 4.2.4 Obligatory participation or encouragement to participate? 5.3.1 Does education about science present specific challenges? Maureen O’Sullivan, BA, BCL, LLM, PhD. Lecturer (Above the Bar) in Law, National University of Ireland, Galway. Chair, Vegetarian Society of Ireland. Fellow, Oxford Centre for Animal Ethics.